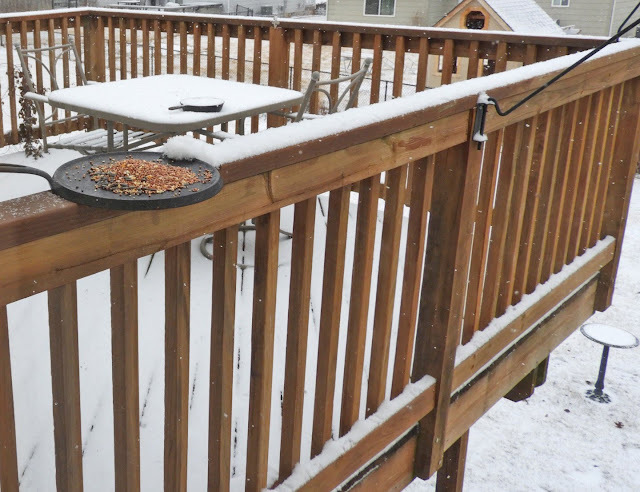 In contrast to my yesterday’s first photo is the deck now covered with snow again. 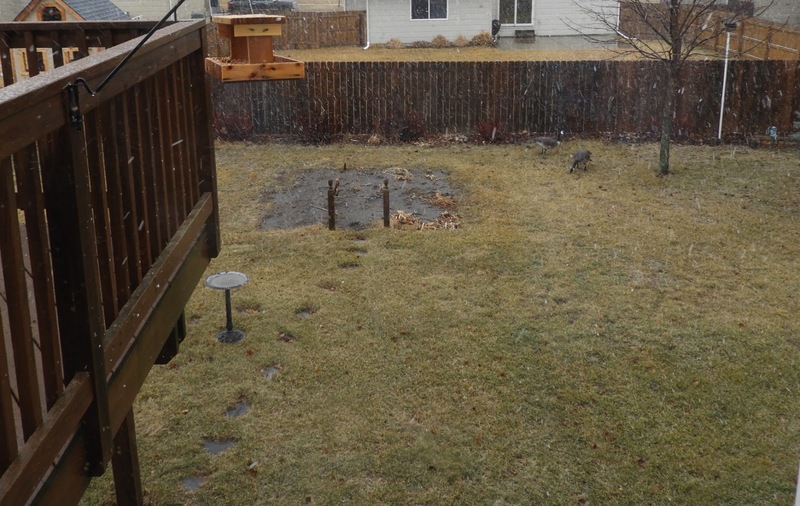 The birdbath is frozen over again and accumulating snow. 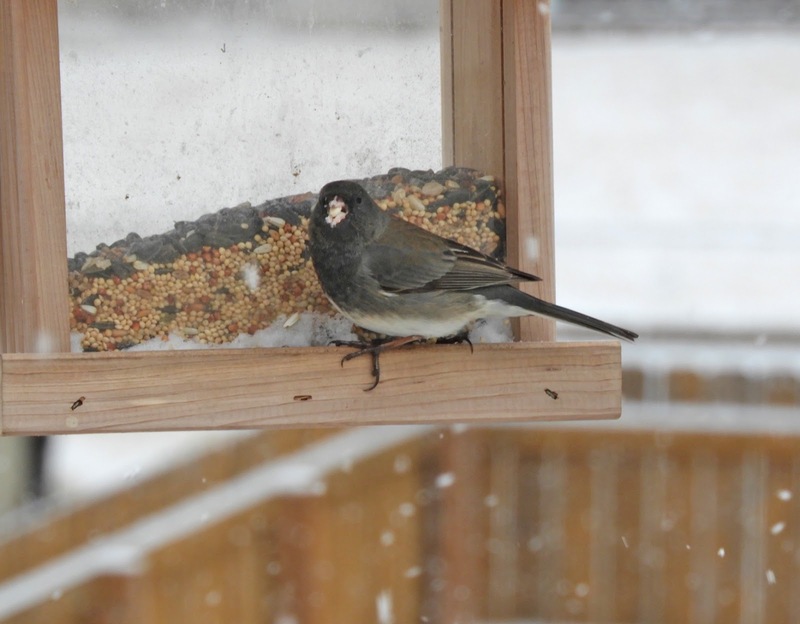 I hadto bring out an emergency bird feeder. Yesterday it looked like this with some rain. The yard actually has a green cast to it of maybe the grass is greening. 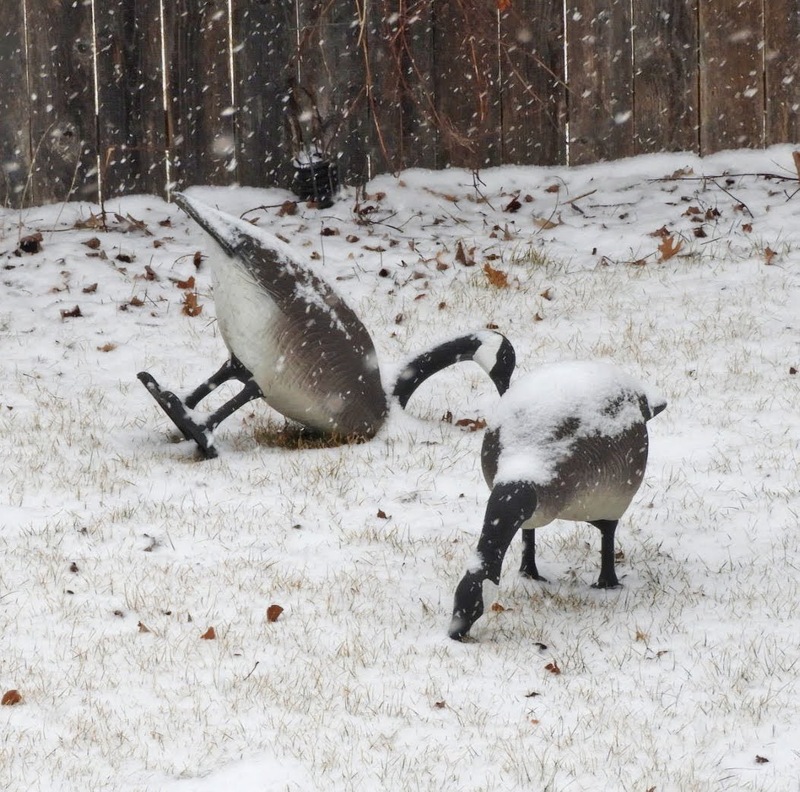 By the end of the day yesterday the male goose is upset and by morning the fake geese are covered with snow again. You can see the snow is falling when you gaze at the fence in the background. I will try to get out there today and set my goose right to the world. I call this my real news of my fake geese report. The birds are back to wading through the snow drifts on the railings. 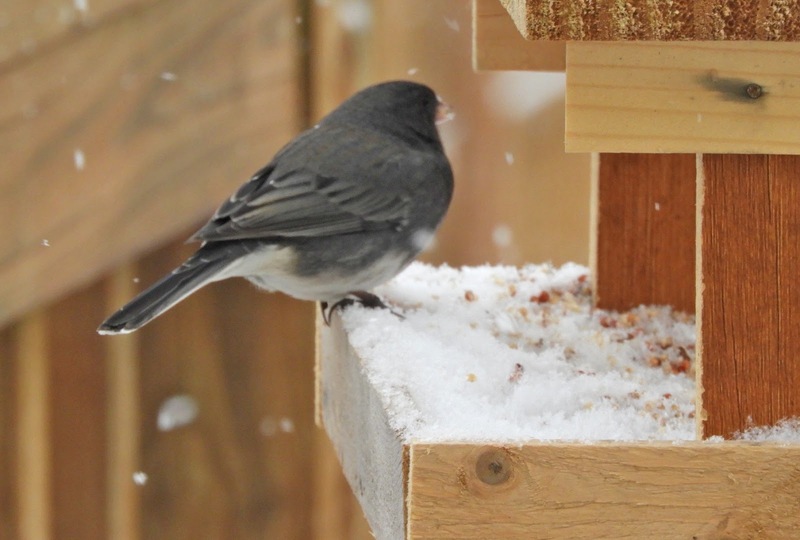 I see them doing a shuffle to clear snow from the railing as well as in some of the feeders. The roof of this feeder is helpful as it does keep some snow from filling in on the center of the feeder. The birds seem to figure it all out and they hit the tray feeder often. 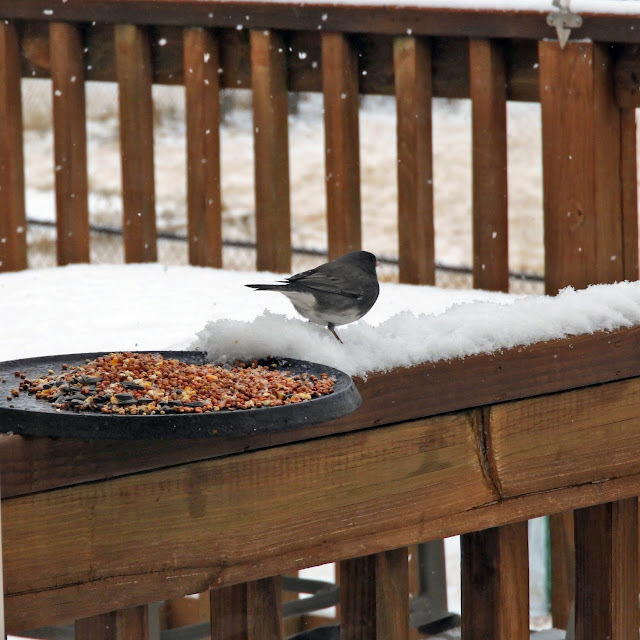 They get into the middle open seed area and shuffle things around to find the other snow covered seed. We ventured out yesterday to the grocery store and it was miserable with the strong winds. It was the warning of what today was going to be like. It is a good day to stay inside and find things to do at home. I moved my hardy geraniums out of the shop with artificial light into the natural light of the sliding glass doors. 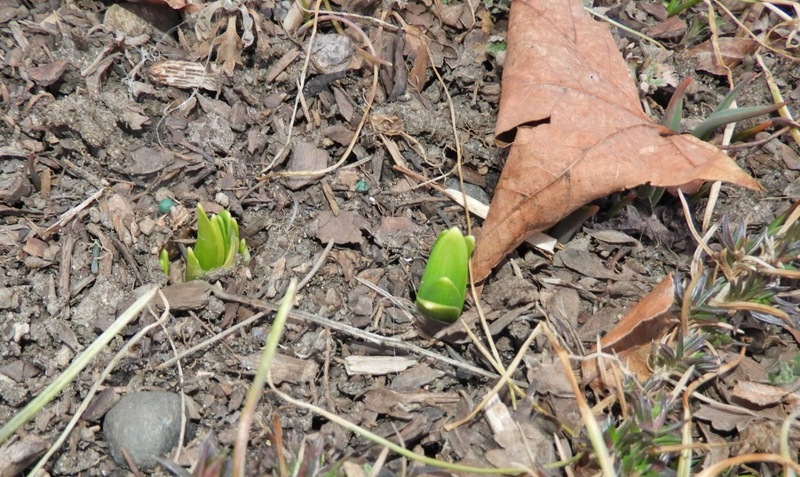 I have one of them still blooming but I bet now the other two will start to put on buds. If I were to start tomatoes in the window for spring, this is the time I need to do it. I think I have thrown all of the starter stuff away in the dumpster. I still have to decide if I can just buy the plants that are started in a greenhouse from a nursery. It sounds good to do it that way but we will see. I think I also threw away my box of many seeds from the old house. The new me in the in the big city will have to start from scratch to grow anything inside or maybe don’t do it all. I seem to be talking garden but it is too early. I have an old house still waiting for me to work on it in early spring. The furnace people called today wanting to check on the new one that I had installed last year. I scheduled them in April to swing by for installation inspection.